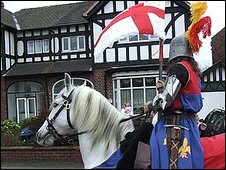 A council in the West Midlands has withdrawn its funding for a St George's Day parade after claims it had attracted some "racist elements". Sandwell Council said it would not fund a parade through West Bromwich on 23 April but it would hold other events. It said footage of last year's parade organised by the Stone Cross St George's Day Association showed it had been "infiltrated" by the far right. The organisers have said the parade was "not political" and "not racial". The association has received council funding for the past five years but organisers said they would have to cancel this year unless they could raise about £10,000. Trevor Collins, a spokesman for the Stone Cross St George's Day Association, said organisers had intended to invite Gurkha soldiers to the event. He said: "I think it's absolutely disgusting - it's not political and it's not racial. We are just proud to fly the flag." Sandwell Metropolitan Borough Council said it made the decision based on advice from a watchdog. The scrutiny management board was asked to assess last year's parade footage and interview witnesses. Council leader Bill Thomas said: "[Their] evidence showed categorically that extremists infiltrated the parade. "A report by our watchdog committee has to be taken seriously, in the same manner as a report from a parliamentary select committee, and is very much part of the democratic process." The council said it would spend £38,000 on St George's Day celebrations and had a proud tradition of celebrating the English patron saint. It said it would provide a family fun-day on 18 April and a St George's Day concert at West Bromwich Town Hall on 23 April. It said it would also raise the flag of St George on all its buildings on St George's Day. The council confirmed the decision to withdraw the funding on Thursday.